My nonprofit organization plans events like conferences, workshops, camps, fundraisers, and more. Is Event Espresso flexible enough for a variety of events? Yes, Event Espresso is versatile and can help with different events. You can create as many events as you would like including free events, paid events, and even display-only events where you want to show event information but not allow registrations. 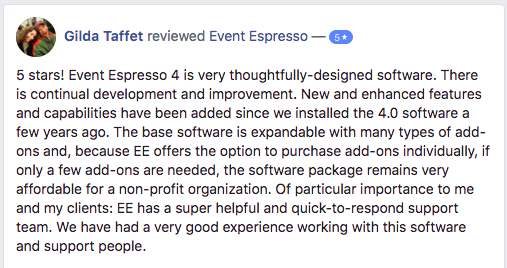 Do I need to be a computer expert to use Event Espresso? We know that your staff and volunteers work tirelessly to support your mission. You don’t have to worry about being an expert with computers to use Event Espresso. If you are comfortable with creating a blog post on your existing WordPress website and browsing your WordPress dashboard (WP-admin), then you’ll find Event Espresso familiar. We also have a quick start guide for Event Espresso which will help you get up and running fast through a series of recommendations and short video tutorials. Do I need a WordPress website to use Event Espresso? Yes, a WordPress website is required to run Event Espresso. However, our sister company, Event Smart offers event registration software for nonprofits using Event Espresso and WordPress as the backbone, where events, calendars, and pricing option selectors can then be embedded on any website, such as Weebly, Wix, and WordPress.com websites. I want to show my nonprofit events on a calendar. Can I do that with Event Espresso? Yes, with the Events Calendar extension, your events will automatically appear on a calendar. Your attendees can browse to an event and then click to begin a registration. The Events Calendar add-on is available as a separate purchase for the Personal support license or Developer support license. However, it is included in the Everything support license. I want to allow more than one attendee to register for my nonprofit events at a time. Are group registrations available? Yes, you can allow multiple attendees to register at once by enabling the Personal Information question group for additional registrants through the lower right area of the event editor and saving changes. Can I accept donations in addition to registration fees? Yes, you can raise funds faster by allowing donations to be made for your events. Here is a video tutorial to help you create an event that has optional donation pricing options. How will I receive payments from my attendees? You’ll receive your funds as your attendees register for your nonprofit events by partnering with a secure payment service and adding your API credentials to Event Espresso. Some of our event organizer favorites are Stripe, PayPal, Authorize.net, Braintree, or Vanco. Or you can choose another supported payment service. Do you offer pricing for nonprofit, NGO, and charity organizations? Yes, we offer a discount on your first purchase on EventEspresso.com. Share information about your organization here and a team member will follow up with you within one day. This discount cannot be applied retroactively to a previous purchase. I have a question that I need help with. Start a conversation with us so we can help you move forward with your nonprofit events today. 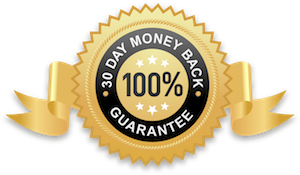 Your purchase is 100% risk free! Try Event Espresso for a full 30 days. Our team will be there to help you along the way with any questions.